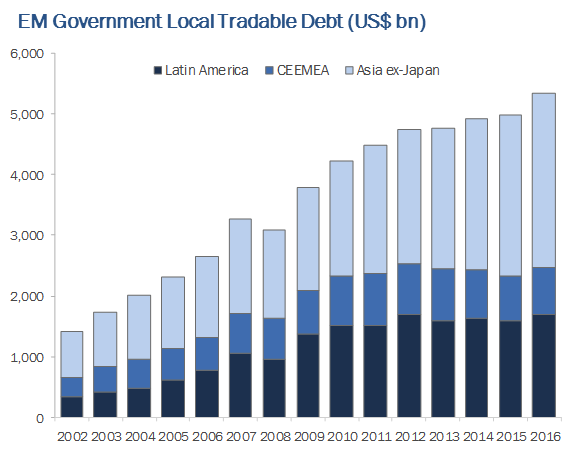 Why EM Local Currency Debt? Over the past few years, the yield pick-up of emerging market over G4 sovereign debt has remained high and within a narrow range of 3.5-4.0% in the 5-year tenor1. Additionally, the asset class has matured, offering investors an opportunity to add value through instrument and market selection, asset allocation and opportunistic investments. The investable universe now exceeds USD 6tn2. 1Source: Bloomberg, TRG Management LP calculations. Data as of June 2017. 2Source: Bloomberg, JP Morgan, TRG Management LP calculations. Data as of August 2016. The allocation to EM local currency debt by developed market institutional investors has grown but is still low. These allocation levels contrast with the share of EM in global government debt market (20%), global trade (45%) and GDP (35%)3. 3Source: Bloomberg, International Monetary Fund, JP Morgan, TRG Management LP calculations. Data as of August 2016.